One of the latest additions in Mattel's WWE Entrance Greats line, Chris Jericho arrives in his "Y2J" look from his WWF debut. Is this figure worth the premium price the Entrance Greats series demands? Or is it an easy pass? "Welcome to... RAW is Jericho!" Chris Jericho established himself as a "main event"-level wrestler years before he entered the WWE (then WWF) during his time in World Championship Wrestling, or WCW. I remember the hype prior to his arrival in 1999, a countdown clock would appear randomly during WWE programming with "Y2J" emblazoned on the Titan Tron screen. When it finally completed it's countdown, Jericho emerged from the stage and made the announcement quoted above. Easily one of the biggest acquisitions made from WCW several years before the WWE ended up buying that promotion, "Y2J" has consistently remained at the top of the WWE roster. 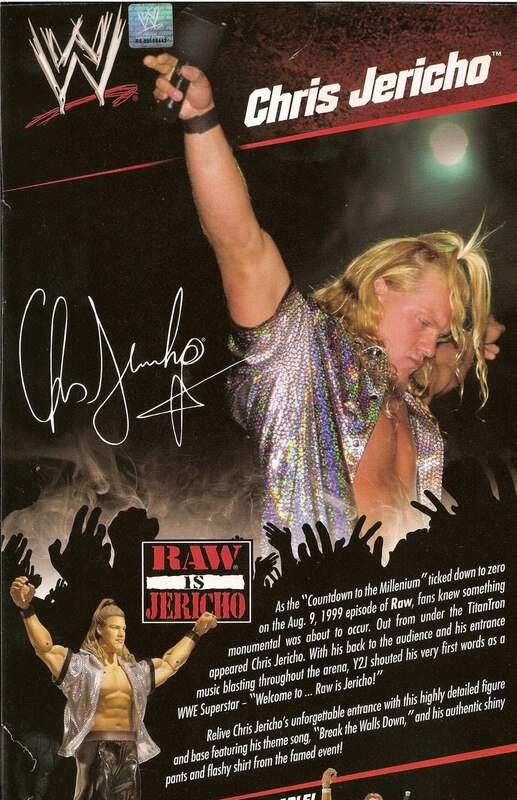 Like his days in WCW, Jericho entered the WWF with long hair and devil-may-care goatee. This figure recreates that look excellently, smug expression and all. This is a brand new sculpt that has yet to appear on other Jericho figures. The main appeal of the Entrance Greats line is the unique attire a Superstar has worn during their most memorable arena entrances. I agree that this is best clothing selection for a "Greats" Jericho. He has two pieces of clothing, both of which are soft good items. The shirt removes easy enough and doesn't feature any type of fastener on the front. The pants close on the back with small velcro tabs. Their made of a more leather-type material and are a little difficult to remove. The belt is a separate piece with the ends stitched on to the pants on the backside. I had yet to see any photos of the figure without the entrance attire. I was pleasantly surprised to find fully painted tights on Jericho. The red tights have silver and black barbwire designs painted all around. Also, "Jericho" is painted sharply in gold along each of his boots. I don't know if Y2J actually wore this under his entrance gear when he debuted, but I'm glad Mattel added it. All Entrance Greats figures have the Basic-style articulation, which is the only real downside to collecting these. I understand the preference for the uninterrupted torso, but personally I don't mind having the ab crunch cutting into the sculpt. I prefer having the added articulation of the Elite and Legends figures and would like to see it on Greats, too. The plain leg articulation doesn't even let you get Jericho into the correct "Y2J" entrance pose, very disappointing. That aside, everything here works as it should with the head being the only point that is a little restricted due to Jericho's hair. Aside from the sharp threads, Y2J includes the Entrance Greats-standard musical display base that plays a snippet of his theme music, "Break the Walls Down", and the requisite Jericho accessory: a microphone. Unlike the mic included with my Elite Santino, which was completely bare, this one has little "WWE" stickers on two opposing sides. I believe it should have the logo on all four sides to be correct, but I may be wrong about that. Full disclosure time: Toys R Us had all Entrance Greats figures on sale last week, which is what prompted me to pick this one up. Actually, I discovered the sale while checking out TRU.com and placed an order for the "Greats" version of Rowdy Roddy Piper along with Elite Finlay (they also had a BOGO sale on all WWE products). Later that day I went into my local TRU where I discovered the same sale was in effect. That's when I picked up Y2J and Legends' Ricky "The Dragon" Steamboat, so I ended up only paying $7.49 for Jericho. TRU usually charges (like many other retailers) $21.99 for the EGs, which is why Triple H was the only one I had and why I keep from collecting them. However, I only paid 1/3 the regular price, that's crazy good! That's probably as good a deal as there will ever be on these, so I jumped at the chance. My only lament is that I couldn't find Million Dollar Man, too! Chris Jericho is an awesome wrestler and entertainer and this is my preferred version of him. I hope Mattel eventually releases a figure of him from this era with Elite-level articulation. I may just pick up the current Elite series Jericho and swap the heads and clothing, just to give Y2J a bit more flexibility on the shelf. However, this figure as-is is a great collector piece and came with a nice surprise in the form of his detailed tights. He looks great with or without the entrance gear and is a fantastic addition to any WWE collection.